Paul Okalik was raised in Pangnirtung, a community that survived starvation, epidemics, eradication of its spiritual heritage, relocation, schooling in a foreign language, and confrontation with the Canadian justice system. He made the decision to improve the living conditions of his fellow Inuit. After ten years in Ottawa universities, he was called to the Northwest Territories Bar and then was elected the first Premier of Nunavut, the new Canadian territory, all in the year 1999. The new government was challenged on all fronts. Education and training was crucial if Inuit wanted to play a determining role in decision-making. 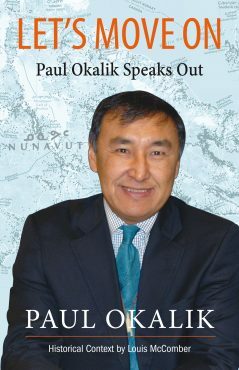 While Paul Okalik was premier, Nunavut developed a civil service decentralized over ten distant communities, built much-needed infrastructures and provided more affordable housing. Though Inuit employment in the Government of Nunavut managed to exceed 50 percent, this did not yet reflect the proportion of Inuit in the population. 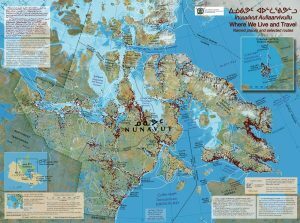 The Inuit’s long-standing goal of self-government in Nunavut remains to be achieved. It is a work in progress. Let’s move on is an expression of determination inherited from generations of Inuit, faced with harsh climatic conditions and colonial policies. Getting bogged down with frustration is pointless. Paul Okalik’s leitmotiv is to move forward with hope and confidence. His story is a lesson in personal and political courage. Let’s move on is also the story of the creation of a representative government in a Canadian jurisdiction with a majority of indigenous people, a dream that cost the lives of Louis Riel and eight Cree leaders some 130 years earlier! Paul Okalik was born in Pangnirtung, on Baffin Island, Nunavut. After being called to the Northwest Territories bar, he served as Premier of the Government of Nunavut from 1999 to 2008. Since then, he has held cabinet positions in charge of several ministries including Justice, Culture and Heritage, Qulliq Energy Corporation, Immigration, Labour, Languages, and the Liquor Licensing Board. Louis McComber lived in Iqaluit, Nunavut, from 1993 to 2005 and quickly became captivated by the process of the creation of Nunavut, the third Canadian Arctic territory. He was a journalist for the French-language weekly l’Aquilon and the CBC North Boréal Hebdo radio show, and wrote a bi-monthly column of political and cultural commentary in Nunatsiaq News. Louis McComber holds an MA in anthropology and has recently lectured in the First Peoples’ program at the University du Québec en Abitibi-Témiscamingue.